Guest blogger and theater historian Ethan Mordden discusses what it is about THE SOUND OF MUSIC that makes it an enduring classic. 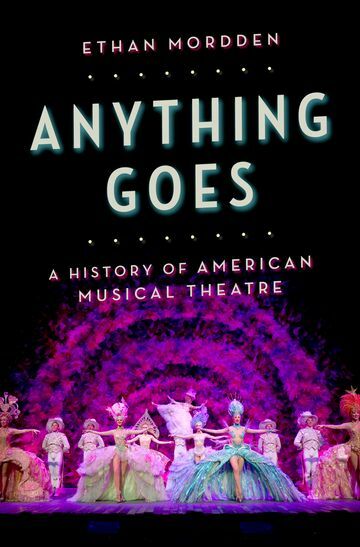 Learn more about ANYTHING GOES by Ethan Mordden. There are many truly beloved musicals, from Show Boat and Anything Goes through Carousel and Guys and Dolls to The Music Man and A Chorus Line. Yet The Sound of Music appears to be the single most popular title of all. The stage show is a perennial; the movie was extraordinarily successful on its original release and remains as basic to an American childhood as The Wizard of Oz and Peanuts; and the score is a favorite not for a few songs but as a whole. Even a number that functions purely as a plot explainer, like “Maria,” with its cantering schottische rhythm and poetic imagery (“How do you hold a moonbeam in your hand? ), bears a keen sense of delight. And “Edelweiss” has such authentic folkish tang that some people take it for an Austrian national song. It isn’t, of course. Like the rest of the score, it is the work of Richard Rodgers and Oscar Hammerstein, in fact the last lyric the latter wrote in his life. 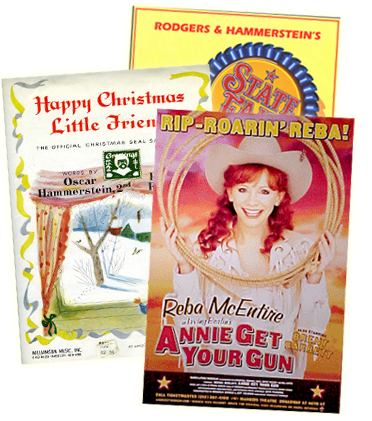 The song does remind us that the R & H scores are rich in atmosphere; Rodgers often composed with an eye on the optics of a scene. Oklahoma!’s “The Surrey With the Fringe On Top” has a cowboy’s bow-legged swagger in its very melody, and, in The King and I, the spellbound “We Kiss in a Shadow” suggests the shimmering of temple bells in the moonlight. CAPTAIN: Before the children meet you, you will put on another dress. MARIA: I haven’t any other dress. When we enter the Abbey our worldly clothes are given to the poor. Anyone familiar with Mary Martin, the original stage Maria, will hear the tone of her blunt tomboy humor on “The poor didn’t want this one.” In the film, Julie Andrews delivers the line with disarming honesty. These are two equally effective ways of showing us that the Captain is utterly unprepared for this humble yet painfully honest and strangely determined sprite and why she is going to change his life from that of a distant, by-the-manual sea captain to that of a loving husband and father. It tells us, too, that The Sound of Music is a nuanced piece, giving its performers a lot of wiggle room in how they develop their characters. This may be one of The Sound of Music’s secret strengths. Compared with such busy musicals as Into the Woods and Wicked, greedily spinning out plots and subplots, The Sound of Music is simple: Maria meets the von Trapps, leaves the von Trapps, then rejoins the von Trapps. Yet there is much for the actors to discover, for on one level the story explores the essences of love: love of nature, of God, of family, of country, of one’s life’s partner. On another level, the musical is about places: the beautiful place of the hills that Maria so loves; the safe place of Nonnberg Abbey; the difficult place of the von Trapp estate, where everyone is starved for affection; and even the dangerous place of a rapidly self-Nazifying Austria. There is yet another place, though it is only mentioned: Vienna, where the Captain’s friends Max and Elsa are from, the major cultural capital of that part of Europe and, in its quiet way, an entity hostile to what Maria represents in the Captain’s world. Yes, she and he are of different social classes—but in an American musical, no matter where it is set, that’s never a problem. No, what sets these two apart is the worldliness of his background and the simplicity of hers. “She climbs a tree and scrapes her knee,” the very first line of “Maria,” tells us, again, how alien Maria is from the women the Captain knows. Imagine the glamorous Elsa climbing a tree! Of course, The Sound of Music doesn’t seem simple, because it contains so many disparate groups—the old and the young, the nuns and the Nazis, the sophisticates Elsa and Max. Then, too, everyone who loves this work has his own Sound of Music, seeing it as sentimental or spiritual, or as a family saga, a love story, even a historical piece. William Wyler, who was originally to have directed the film version, saw it as a saga of freethinkers vs. fascists, envisioning a somewhat apocalyptic Escape From Terror (with a tank breaking down the Abbey walls) that forced studio executives to hire someone with a more elevated perspective. MARIA: The Mother Abbess...said that you have to look for your life. CAPTAIN: Often when you find it, you don’t recognize it...Then... all of a sudden, it stands before you. This very touching moment reminds us that all of us start out thinking we can control our destiny, only to learn that destiny is a ski jump and we are sheer amateurs: once we take off, we have no idea where we’ll come down. Sometimes a thing just happens. This may be another of the show’s secret strengths: it mirrors our own experience, even in its different time and place. None of us is Maria, or the Captain, not to mention the Mother Abbess. Yet we recognize them. We’ve all had a Captain (tightly wound and distant) or a Mother Abbess (wise and a bit impenetrable) in our lives, sometime or other. And we’ve seen our Captain melt as he does, spellbound by music and Maria, which is the “feel good” part, and our Mother Abbess teach us something interesting about ourselves. The serious part. That may be why some of us can’t get enough of this marvelous show. A friend of mine, when he was very young, fell in love with the movie’s soundtrack LP, and played it over and over, all afternoon after he got home from primary school, day after day after day. Then, suddenly, he could not find the disc...and his parents, when he asked, claimed they had no idea on earth where it could have got to. I asked him if he realized, back then, that they must have hidden it, and he said no. At that age, everything’s a mystery. Sometimes a thing just happens. Ethan Mordden’s first Broadway show was another Rodgers and Hammerstein musical, The King and I. He was raised in Pennsylvania, Venice, Italy, and the suburbs of New York City. Educated at the Locust Valley Friends Academy and the University of Pennsylvania, he has written extensively for the Wall Street Journal, The New Yorker, and the New York Times.